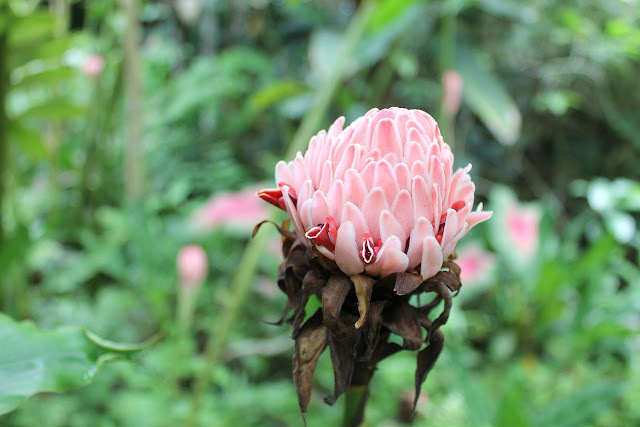 Geoffrey Bawa, near Aluthgama, filled with exotic flora and wild monkeys in the trees! It seemed straight out of an Empire of The Sun music video with the colourful jungle habitat, meditative sounds, vines and tropical plants everywhere. I'd never been to a rainforest garden before and it was spectacular! The heat was almost unbearable at mid day and sweat glazed my brow but we were able to rest inside the house at the top until the worst passed. 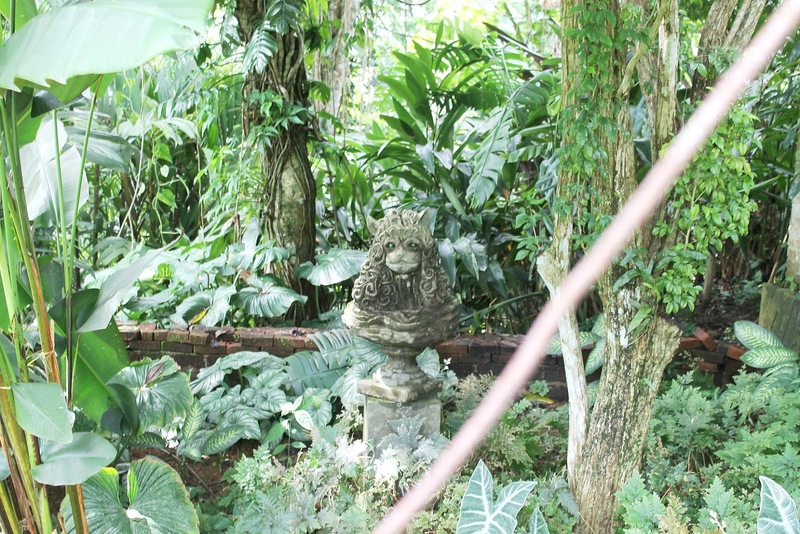 This statue looks straight out of a Narnian kingdom, its gleaming green eyes staring through the undergrowth. 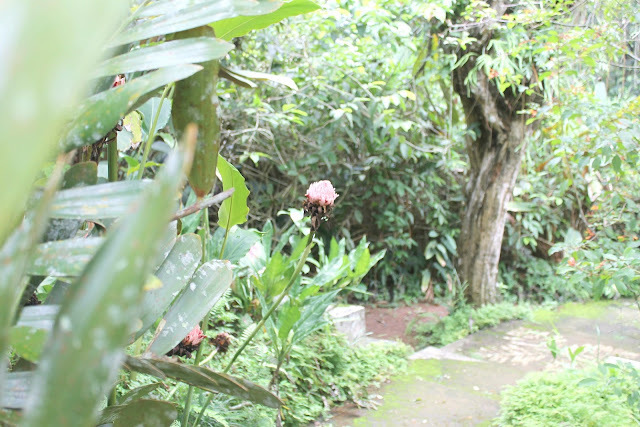 The area was so lush and green, blessed by the recent Monsoon rainfalls. 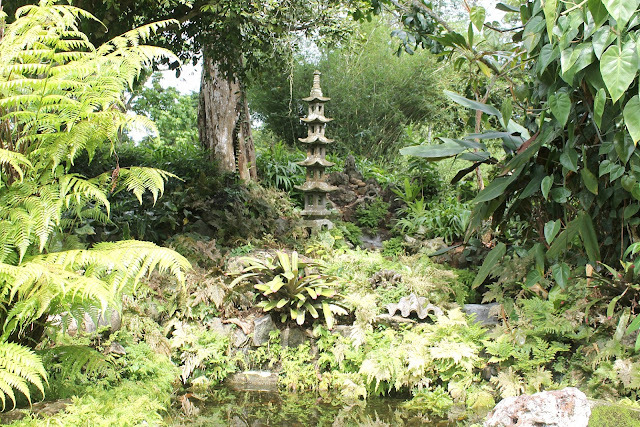 The gardens were maintained but only so much that different kinds of wildlife, exotic lizards, birds, butterflies could live there and make their homes. Thankfully we didn't spot any snakes! 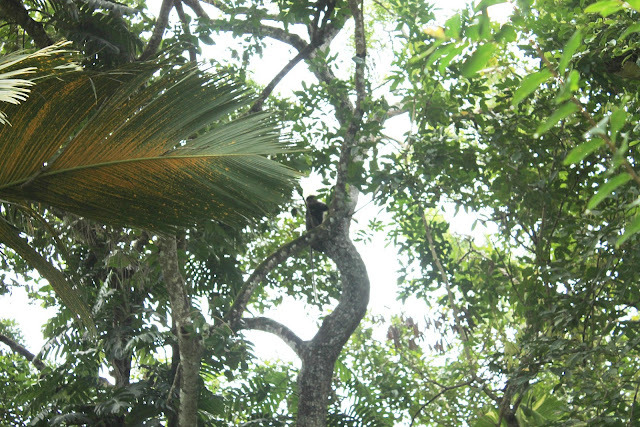 Spot the monkey! Above our heads wild monkeys thrashed about in the trees and as branches and fruit shells came out of nowhere, we fancied they were throwing things at us. Part of me longed to erect a treehouse and live peacefully alongside the monkeys, meditating by rock pools, eating fruit and bathing in rainwater pools perfumed with frangipani petals. 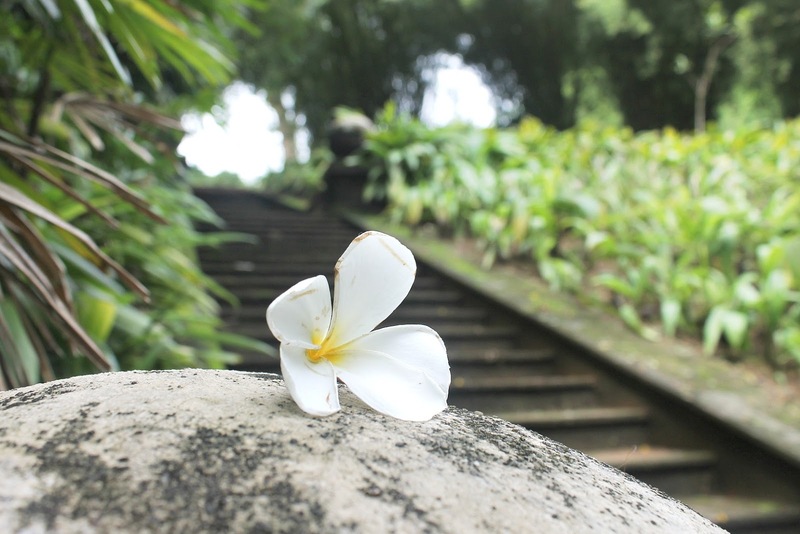 Frangipani flowers lay everywhere, scattered at our feet and the air was filled with the sweet, earthy scent of them. It was one of the most serene, peaceful places I've ever visited. 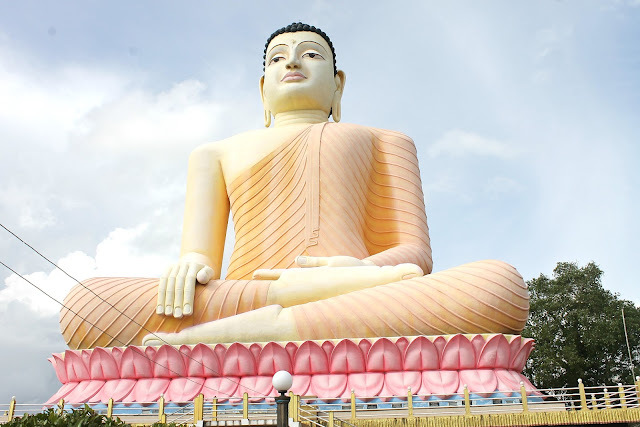 After visiting the gardens, we saw the huge Buddha statue at Aluthgama belonging to the great Kande Viharaya temple. 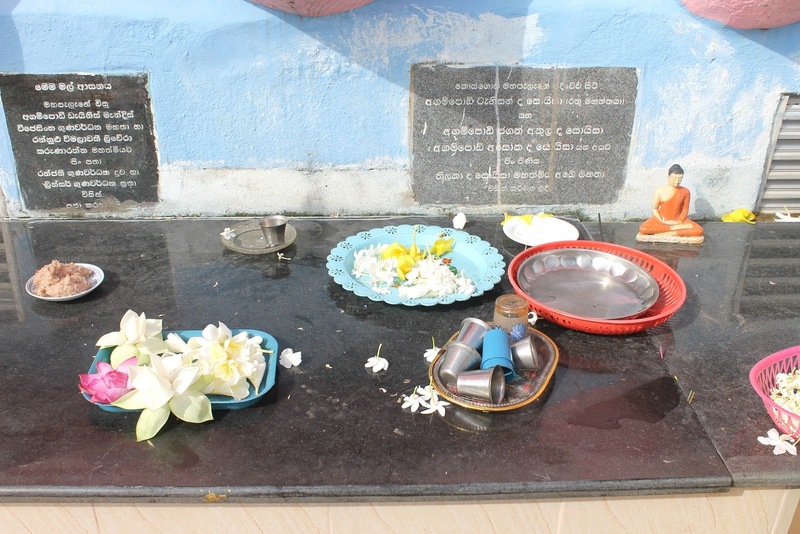 It was the most beautiful thing, surrounded by inscriptions and little offerings of flowers and rice. I left my own little bunch of flowers at his feet. I loved padding around the inside of the temple in my lotus skirt and bare feet and admiring all of the stunning handmade 3D paintings on the walls, depicting important Buddhist tales and teachings I'd heard about, and the history of the teachings I find still find so useful today, to help alleviate suffering. I loved picking out the different symbols and going over the stories again. It was a kind of pilgrimage I've always dreamed of taking! 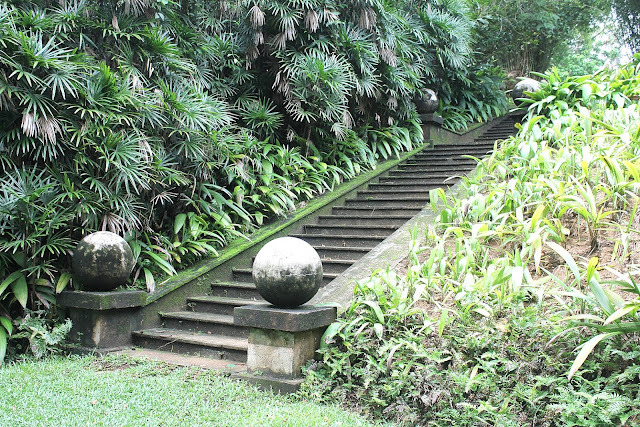 Stay tuned for the next part or go here to read about the first part of our visit, including the Bentota turtle hatchery. Wow! Such beautiful photos. Thank you so much for sharing with us! These pics look amazing! Makes me wish I was there. Glad you're having a good time. Can't wait for the next part! These gardens look amazing! Having monkeys all around you must have been so cool. That's not the kind of animals we're used to haha. The heat was worth it after all, you got the full experience here :D The statue is a bit creepy, totally looks like something from Narnia it's true! These photos are stunning! Everything really does look so lush! These photos are beautiful, so pretty and everything looks almost magical! Looking forward to read more about your Srilanka pilgrimage. Youve greatly captured the beauty of nature. Will be looking forward to see more. Such a beautiful place I love your photos from the trip! These photos are beautiful! I'd love to go there one day! Wow! 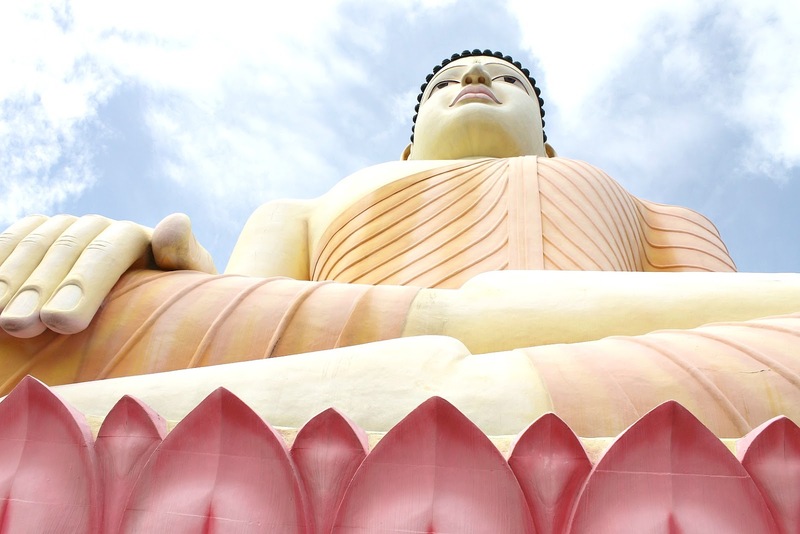 Sri Lanka has always been on my travel wish-list and you have definitely made me want to book a trip asap!